The Bbq Tools Set rack is hanging a spatula, a silicon Basting Oil Brush, a bbq fork, a Bbq Tongs, and a mini tray. 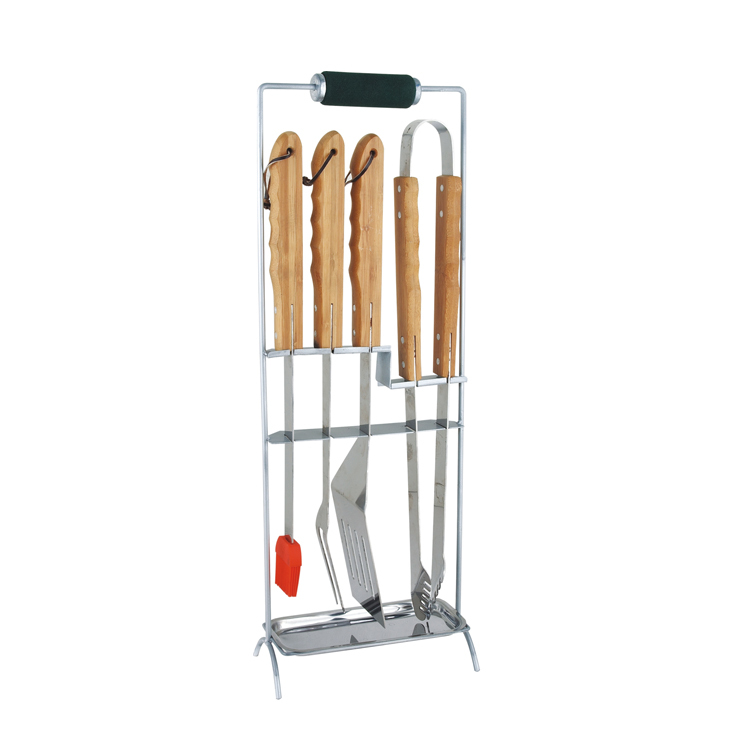 Each tool is made from heavy-duty stainless steel with wood handles. The slotted spatula is thin but strong enough to hold the meat. The tong with serrated help you grip the food more easy.The bracket of handle we designed a soft skid resistance cushion. The wood hand designed with raised grain for heat proof and skid proof ! Looking for ideal 6pcs BBQ Tools Set Manufacturer & supplier ? We have a wide selection at great prices to help you get creative. All the Rest Rack 6pcs BBQ Tools Set are quality guaranteed. We are China Origin Factory of Bbq Grill Tools Set. If you have any question, please feel free to contact us.